Many manufacturers claim to provide supplements that target belly fat, but the feasibility of such claims is highly debatable because the body deposits and burns fat in a a specific order that is dictated by each individual’s DNA. Some people may put on fat around the belly, followed by the hips, and then the thighs. When the body starts to burn fat for energy the order would normally be reversed. The fat around the thighs would go first and the belly fat last of all. 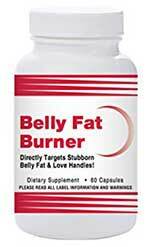 However, if the formulation can trigger fat burning, the belly fat would be reduced sooner of later. Vitamin B12 (10mcg): A versatile vitamin that is known to be necessary for a healthy metabolism. 7-Keto DHEA (5mg): An ingredient that is often used as a metabolism booster. One scientific study shows supplementation with 7-Keto DHEA can be effective for weight loss when used in conjunction with diet and exercise. Coleus Forskohlii Root (50mg): An ingredient taken from a South American plant. The results of one study suggest supplementation with coleus forskohlii can decrease body fat and boost testosterone levels. Fucoxanthin Extract Powder (150mg): A seaweed extract that may support weight loss over a period of time. However, the standard dose appears to be 2.4 -8mg. The amount provided here is much higher. Green Tea (50mg): A powerful antioxidant that supports good health and has been proven to help the body burn fat faster. Evening Primrose Oil (60mg): A plant extract that is unlikely to support weight loss. However, evening primrose oil contains fatty acids that may be useful for promoting improved health. Calcium Private (160mg): An ingredient the body produces when it breaks down sugars. Supplementation with calcium pyruvate may be beneficial for weight loss and improving athletic performance, but further study is needed. Phenylethylamine (150mg): An ingredient that is derived from the amino acid phenylalanine. Supplementation with phenylethylamine is believed to improve alertness and enhance the mood. Usage Instructions – One capsule is required two times per day. Although a few people appear to be pleased with the results obtained, customer reviews are predominantly poor. Natural Living fail to mention if side effects are likely to be a possibility. This is a fact that is quite shocking for company that is owned by a medical doctor. Side effects can never be ruled out with any brand of supplement, so Belly Fat Burner is unlikely to be a suitable dieting option for pregnant or nursing mothers. People who have health problems or concerns should always seek medical advice before taking any brand of supplement. The same advice is offered to anyone who is using medication or planning to use Belly Fat Burner alongside other supplements. Belly Fat Burner is a weight loss product produced in America by Natural Living and the fact that the company president, A. P. Jones, is a medical doctor would appear to be a big point in its favor. However, that may not be the case. Jones is responsible for marketing a number of other weight loss products and the bold claims he has made for his products landed him in hot water with the Texas Medical Board more than once. In 2010, and he was ordered to pay a $1,000 administrative penalty. It is also possible to purchase via Amazon.com, but the price per bottle is the same. Belly Fat Burner is not backed by a money back guarantee, but Natural Living say they will refund the purchase price of any unopened bottles that are returned to them within 90 days of the date of purchase (according to the “policy” page) or 60 days (according to the FAQs page). In theory the ingredients in Belly Fat Burner should be able to encourage fat burning, but we think it is unlikely the formulation will be capable of specifically targeting belly fat. The use of unrealistic claims is not surprising though, bearing in mind the company’s past track record. However, although the ingredients should be able to encourage some degree of fat burning, many customers say the product let them down. This could indicate poor blending techniques or the use of low quality ingredients sourced from cheap suppliers. This is of particular issue because Belly Fat Burner is not backed by a guarantee, so customers are advised to think long and hard before ordering this particular dieting products. Our top rated diet pill is PhenQ, It targets all forms and kinds of body fat. It can burn excess body fat as well as preventing the absorption of recently consumed fat from food. PhenQ is also an appetite suppressant that can help to significantly reduce your daily calorie consumption.